Gear up for the biggest AVC yet! Wow, what a difference a few years make. When we first started the SparkFun Autonomous Vehicle Competition (or AVC) back in 2009, it took place in our parking lot and a few dozen people showed up. It was an awesome day, but was definitely a low-key affair. Fast forward to today, and we are in the midst of planning what will undoubtedly be the biggest, best AVC yet. So big, in fact, we had to move it from SparkFun headquarters to a new location - the Boulder Reservoir on the outskirts of sunny Boulder, Colo.
Today we are excited to announce that registration is now open and there are a BUNCH of new rules, regulations, and classes. We think these new rules will make for the most competitive and exciting AVC to date. The scoring system is even different! We've created an AVC page for all things related to the competition, so head over there to check out what the deal is and to register as a competitor or spectator! We've learned a lot from previous years and have decided to make the course easier to navigate. For ground, we've repainted all the barriers, obstacles, and checkpoints to be different primary colors. And if you head over to the AVC site we've got the full dimensions and even paint colors we used. Additionally, we have a full dimensional drawing of the course in addition to GPS waypoints and tracks. The scoring is also completely different this year and isn't based on the single best time. The new scoring is based on a point system which you can check out here. Be sure to read the full rules before signing up - we don't want you to encounter any surprises at the last minute. We've also drawn up some course maps to give you a better idea of what you're up against. Also be sure to check out the GPS information available on the AVC site. The event is going to take place from 8:30 a.m. (8 a.m. for competitors) to 5 p.m. (or whenever we finish!) on June 8th, 2013 at the Boulder Reservoir. If you've read everything on the site and still have a question, you can email us at avc@sparkfun.com. Sign up your team today - we hope to see you there! Ok, sorry I cant come myself. Please reserve a 40x2 meter landing area for my Drone will arrive around 3:23 pm to bring my AVC, expecting to arrive from direction NNE. Please insert any rewards/prices behind the Drone door marked "X34.3". This is glorious! Love the new categories and scoring system, and setting the air course over water really adds a nice "do or die" touch. Can't wait! "adds a nice âdo or dieâ touch." also probably makes the insurance company happy. ...so, what does PBR mean? I keep coming back to Pabst Blue Ribbon. Seriously, I don't know what PBR stands for. Does anyone? I think for years to come, the official announcement of AVC day should be on PI day. Is Sparkfun providing a recovery boat? actually, yes as well. there will be an ambulance. OK have to ask, are the barrels weighted? I was thinking some sort of sonic pinger. Throw something at it and listen to the sound it makes. Do you have the acoustic properties of the barrels in the course specs? wow, no. just avoid hitting the barrels. Unfortunately cheap, effective graviton sensors aren't yet available. Maybe by AVC 2093, though. psh. step 1, aim for barrel. step 2, approach 50mph (or so). step 3, ram barrel head on. step 4, do you still have an intact vehicle? if so, it was probably empty. and there's 4 barrels, so, rinse, repeat. Didn't see it, but is there a deadline to signup, or would you accept a competitor up to the day of the event? I don't think we are going to have the option to accept payment for competitor registration the day of. Also, we will need to organize the heats and such before hand, so my guess would be that the registration will close before competition day. I'd recommend emailing avc@sparkfun.com to double check however. Too bad the aerial is over water. We have a brand new quad we were going to enter but it would be irresponsible to risk loosing it in the water. Is there different prize pools for airplane vs (multi)rotor? Any other difference for the two types of vehicles? Or are all "flying things" treated as one single group of vehicles? There's a discrepancy in the width of the ramp. The video says it is 4.5 feet (53 inches) and the 'obstacle breakdown' says it is 45 inches. Not a huge difference, but you should let us know which is the correct width. How long is the ramp? after my craft augers into the lake, the reservoir is still open for wakeboarding right? You need a boat/BO-AT/aquatic vehicle class, that would be cool. Hey, are multirotors and helicopters allowed this year? Yes. There isn't any restriction on the type of vehicle (ground or aerial) this year. Looks like it is going to be awesome! Any thoughts of taking the AVC on the road? You might be able to partner with local organizations to make things work. I would love to do this someday for a senior design project or just for fun, but the distance from West Michigan is quite prohibitive. it's an insane amount of work, permits, and coordination. taking it to multiple venues would be nearly impossible with the number of people we currently have involved in the project. Yeah, they kind of went with a cycling theme here: Doping == Lance Armstrong, Peloton == the pack (everything else). I think you should get extra points if your air vehicle can land on the water, and drive out to stop in the landing zone. And for next year maybe add a payload pick up point. So, what next? Will Free Day 2013 return in some other form? Read full article for details. Signed up, ready to rock! I hope our vehicle is finished in time! Though you say 'little robot', so perhaps the ramp dismount itself would be a challenge anyway? You should probably avoid the ramp. It's far enough outside of the normal course that if you are already accidentally on track to hit it, you will still need to veer left again to get back on course. surprised they allow you to fly over the water. With all potential of RC's falling into the water and polluting the water with oil and gas of some kind. We will have our best and brightest out on the water scooping up downed crafts. He practically lives in his row boat, so this will be right up his alley. ok, going way out on a limb here. no laptops or other devices, but should one so desire could a (preferably cheap end) smartphone be used as the vehicle controller? they do support software development and hardware control, have built in gps, etc. just put it in airplane mode (no pun intended) to prevent them from receiving calls to control it? re-read the rules. it's covered. a phone doesn't require a base-station to work, so you could use a phone as your 'brains'. as long as it's only using GPS and such, that's fine. What rules govern the "less than $350" determination? If someone scores an originally $500.00 electric RC car for $0.50 on eBay, is the value of the part $0.50 or $500.00? of course this is a possibility. if you bring a $500 chassis, you have a $500 robot. we're not ranking people on their frugality, but the technical level (and cost) of the vehicle. Does that make sense? If your buddy works for a company that makes a $10k sensor and gives it to you for free, you won't be competing in the budget class, you will be competing in the doping class, because that best defines your vehicle. Is there a limit on how many registrations you are allowing? I'm not sure our bot will be ready in time, but I'd rather risk $30 than miss out if the race fills up. There are unlimited entries this year, but registration closes 1 month before the event. if we get an overwhelming amount of entries, we might be forced to close it earlier, but at this point we don't foresee having to do that. What about a bonus for starting autonomously? As in you (person starting the race/timer) says go, magic happens and the vehicle starts based on your cue (no builder intervention), and you (the creator) collect fame and glory with out actually doing anything but placing it on the line and turning the power on? good idea, but not this year. there are too many variables to consider. and people would be asking for voice recordings of me saying 'go', or how loud the starter pistol is, etc. ideally, we'd like to give each entrant a 'module' that would trigger them to start, so we could guarantee each one starts at the same time, but that could be problematic. yeah, but each one would need to be on a different channel, and there could be interference, etc. there are still a LOT of variables here to take into consideration. trust me, I've thought about it, and there's not a fool-proof way to do it perfectly and reliably. Couldn't you do a single tone (say frequency of 500Hz) that plays for 3 seconds. Then its up to the person entering to have to listen for that frequency. Or perhaps an IR source that flashes at a specific rate (say 1Hz until the start, then 10Hz for go. or just on for wait, off for go). Then the vehicle would just have to have a sensor aligned with your source as part of the vehicle. Could it be optional just like automated landing would be? I do agree, it would be a huge pain, but it would still be pretty slick to see someone who simply places something on the line and then picks it up after its completed it circuit! I emailed you more robust answers, but no base stations at all, unless it's something that already exists and is accessible by anyone. 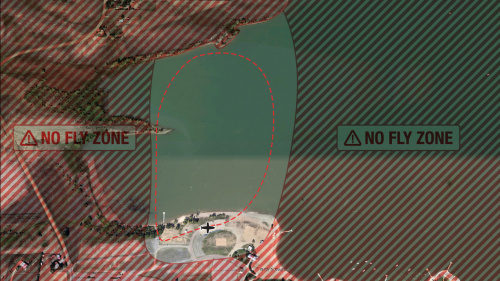 there will be no spectators allowed on the flying portion of the aerial course, so you will be looking at bare ground. Is it me, or is there nowhere where the direction around the course is indicated, clockwise, or anti-clockwise. I'm guessing anti-clockwise, but there are no indicators showing that ! it's anti-clockwise, and it's in the animation in the video. If my vehicle is large enough do all of my wheels have to be on the ramp? Can one side of it go up on the ramp and still get full points? you can't just clip or touch the ramp, you have to fully go on the ramp. so, all 4 wheels or whatever, and hopefully catch some sweet air. Robert, thanks for answering all these rules questions. I have a few more; last year it was virtually impossible to shortcut the course -- the building kinda got in the way. This year, a rover could go inside a waypoints. What if it went around the first waypoint, inside the second waypoint (miss!?! ), through the hoop, around the third waypoint, misses the ramp, around the fourth waypoint and over the finish line in 100 seconds. How many points for this run? Also, is a rover DQ'd for wandering inside the inner fence or outside the outer fence (even if it makes all the waypoints)? Thanks, this will help me know how to tune my rover! There may or may not be a barrier on the inner part of the course. According to your example (assuming you could go on the inside of the course), you would 25+25+25+50. So, 125 points. You would get no time points, because those are based on a successful run, which this was not. You would only get bonus points. So, someone who completed the course without the hoop in 4.5 minutes would have more points. A ground vehicle cannot be DQd for going in or outside of the course. The only 'limits' you have are time. if you want to just drive straight and keep going until you hit the mountains, go for it. we'll just add up whatever points you got after 5 minutes. "Micro/PBR â Less than $350 total spent, OR small enough to fit into box thatâs 10"x6"x4"
"Micro/PBR â Less than $350 total spent, AND small enough to fit into box thatâs 10"x6"x4"
Someone needs to create a dog riding robot that steers by launching dog biscuits (or hanging one on a servo pole). Doesn't appear to be against the rules and it would be awesome. So the runway will be dirt? Any idea how long it is? about 275 feet long total. it's gravel. 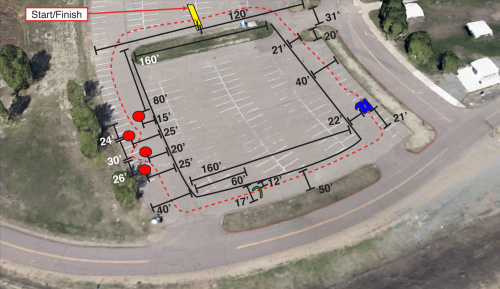 check out the GPS zip file for gps waypoints and a track around the landing/take-off zone. Will we be able to go to the site before the competition for test flights? I want to make sure the wheels can handle the gravel and can get up to speed in that short of distance. Yes, the reservoir is open to the public (but you gotta pay to enter) year round. And keep in mind that the take-off strip is nearly twice is long as it was at our building. It should be significantly easier. Also, in the summer months, the ground will be dry and hard and will can sweep or smooth the ground as best we can to make it less rough for take-off. But ultimately, it's advised to prepare for rough terrian when taking off. I was just saying how we needed a gatling air-soft gun to keep the planes under control. I'll check with Pete to see if it is in the engineering budget. If a ground vehicle in a non-"Doping Class" category outperforms "Doping Class" vehicles, are they eligible for those prizes as well? each category is judged separately. you can only win prizes for your category. Was the passing fire truck behind the Sparkfun obstacle barrels an ominous foreshadowing of things to come, or happenstance? Either way, I like it.